Jerry, George and Elaine return from their trip to India that they don't want to talk about. Sue Ellen calls the wedding off and Nina doesn't want George or Jerry. 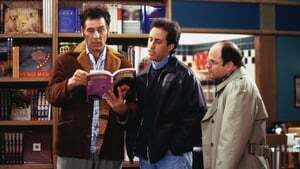 George finds out that Jerry slept with Nina and Elaine slept with the groom. Kramer and FDR settle their score, a snowball with something extra. Jerry "schnapps" Elaine to find out why George is so bitter with him. Kramer tries to out wish FDR. Elaine, Jerry, George and Nina arrive in India, where Elaine discovers that the groom is someone she slept with and that they are the only people from the U.S. who are attending the ceremony. Kramer is angry with Newman because he didn't use his birthday wish to save Kramer from FDR. George "schnapps" Elaine to find out the secret Elaine is keeping about Jerry and Nina. Elaine buys tickets to India to spite Sue Ellen by showing up at her wedding. 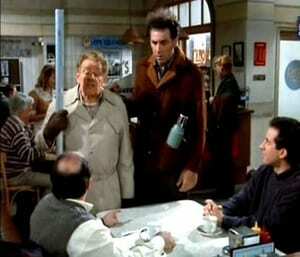 Kramer tries to get Newman to use his birthday wish to protect Kramer from FDR. Elaine finds that Jerry and Nina have just slept together. Elaine meets the parents of Sue Ellen's fiancé who try to convince her not to go to India for the wedding; after all they aren't even going. Jerry and Nina suffer an awkward pause in their conversation. Kramer confronts FDR about his birthday wish. 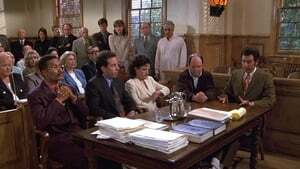 Elaine's mail from India is an "unvitation" to Sue Ellen's wedding in India to someone whose name seems familiar to her. George asks Jerry to call Nina about setting them up on a date and realizes he must where his Timberlands every time he sees her. Jerry and George are walking down the street and they run into Nina and old girlfriend of Jerry's whom he never slept with. Kramer attends FDR's birthday and FDR gives him an evil eye right before blowing out the candles on his cake. 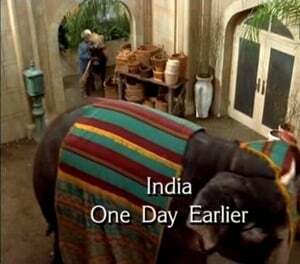 Elaine receives an item in the mail from India. 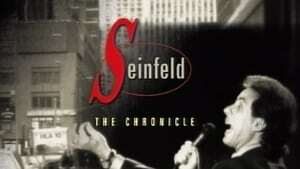 Two years earlier, Jerry tells George and Susan that Nina might be the one; Kramer nails FDR in the back of the head with a snowball; Elaine is dating an Indian man named Peter (Pinter). Eleven years earlier, new resident Jerry tells his neighbor across the hall, whom he calls Kessler (it's the name on the mailbox), that what's mine is yours. Jerry's girlfriend walks around his apartment naked; she even eats breakfast and plays Scrabble naked. 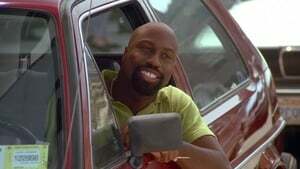 An old friend of the gang named Jason is going through Alcoholics Anonymous (AA) and is currently working on step 9, where you make amends to individuals for past wrongs. George is anxious to receive Jason's apology for the humiliating neck-hole incident. Elaine is offended when her co-worker, Peggy, can't tolerate Elaine's germs, but easily tolerates the germs of other people. 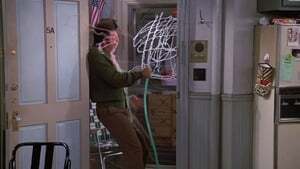 Kramer discovers he's been taking too long in the shower, so he tries to make some changes to his shower routine. Jerry comes to realize there is good naked and bad naked, when he sees his girlfriend coughing. Jason stops by the restaurant to apologize to Jerry, but fails to apologize to George. George confronts him later, only to be humiliated some more. 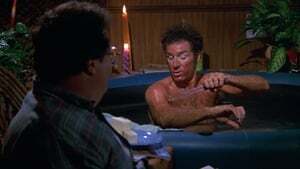 Kramer changes don't work out, so he asks for advice from Jerry and observes the men in the shower at a health club. Elaine confronts Peggy and gives her some germs. 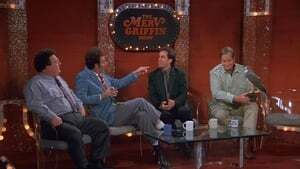 George tells Jerry how he can show his girlfriend the concept of bad naked using a belt sander. Kramer decides to live in the shower. George talks to Jason's sponsor, who recommends that he attend a meeting, only it's not AA, it's Rage-oholics Anonymous (RA). Jerry executes George's plan. After doing his dishes in the shower, Kramer decides he needs to add a garbage disposal to bathtub. Kramer calls on Puddy for installation advice. Elaine tells Jerry one of the problems with his body and why a naked male body isn't attractive. Puddy tells Elaine why her co-worker doesn't like her germs, she's a "germ-o-phobe," like he used to be ten years ago. He accompanies Elaine on a visit to Peggy to prove his theory. Jerry convinces his girlfriend to put on her clothes; however, he can only picture her naked and unfortunately she can only do the same with him. Kramer cooks up a meal that he serves to Elaine, Puddy and the recovering Peggy, only they all react badly when they find out the kitchen was in the shower. Jason tries to apologize to George, but it isn't quite what George had in mind so they both go into a rage. 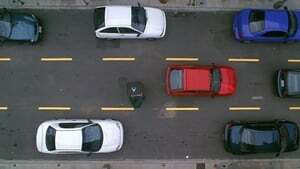 Jerry plans to buy a new car with an insider deal from Puddy, who's been promoted to a car salesman. 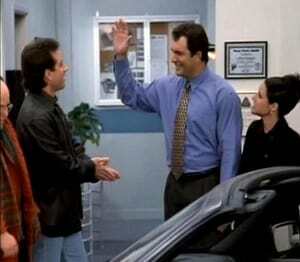 Jerry ends up bargaining with Puddy and Elaine to get them back together so he can get a better deal on his car. Kramer takes the car Jerry is planning to buy for a test drive with another salesman, and decides to see how far past empty the gasoline can go. George seeks out something to eat and must settle for a vending machine candy bar, which ends up getting stuck. After George leaves and comes back, George suspects a mechanic of stealing the candy bar. Then George comes up with a creative idea to implicate the mechanic. George tries to break up with his girlfriend, Maura, only she doesn't agree. Jerry has purchased cuff links worn by Jerry Lewis in Cinderfella. He plans to use them as a conversation starter with Lewis when he goes to an upcoming roast at the Friar's Club. Having the same first name isn't enough. A man of mystery that she has met intrigues Elaine. Jerry suggests that perhaps he is a super-hero. With robberies occurring in the building, Kramer has obtained a strongbox to hold his valuables. He needs to find a place to hide his key. A place that no one knows, except him. His first place doesn't work. George lays out all of the reasons that they should be officially broken up, Maura still doesn't agree "to turn the key." Elaine gives up on her mystery man when he runs from a woman that Elaine deduces is his wife. She returns to Jerry's apartment to find that his intercom is broken. So she shouts to him from the street, about the mystery man, while she waits for the opportunity to get into his building. 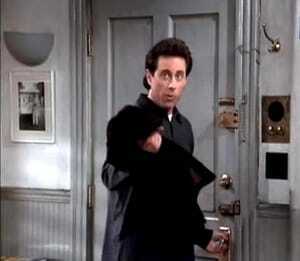 Jerry inspects his intercom, only to find Kramer's strongbox key hidden inside. Kramer hides his key again. Jerry finds the key again and decides to go down to let George in. While downstairs, a neighbor who's forgotten his key and is unknown to Jerry asks to be let in. Jerry denies him entry. Elaine goes to the mystery man's shabby apartment and discovers he is poor and on welfare. The woman he ran from is his welfare caseworker. Jerry discovers the keyless neighbor, does in fact live in his building, on the 5th floor in apartment 5E (!) right next door to Kramer. Elaine tells Jerry about her mystery man's super powers. George decides that cheating on Maura might be his ticket out. Kramer lets Phil, Jerry's "new" neighbor, keep his parrot in the hallway. 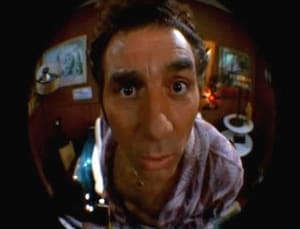 Kramer also hides his key at Phil's. Glenn, the mystery man, takes Elaine on a date in the alley. Jerry needs his cufflinks for the roast, only to find out that Kramer has locked them in his strongbox. The key to the strongbox was hidden in the parrot's food dish, only now the parrot is dead (from food poisoning) and buried in a pet cemetery. George tries getting caught with the other woman, only both women agree that they can work with George through this incident. Elaine discovers that Glenn is, in fact, married. Kramer and Jerry go to the pet cemetery to exhume the key, his neighbor catches only Jerry. George asks what's in the cooler (strongbox) as he easily opens it up. Jerry buys his dad a $200 Wizard organizer for a birthday present. George receives a message from Susan's parents, the Rosses. Jerry and George debate about the race of Elaine's new boyfriend and that intrigues her (is he black?). George returns the call from the Rosses; the Foundation is having an event this weekend, but George can't attend, he has to close on his house in the Hamptons. Kramer announces his retirement, a Hollywood big shot has optioned his coffee table book about coffee tables. 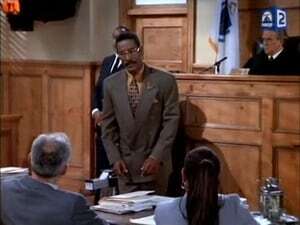 Elaine finds evidence that leads her to believe her boyfriend is black. Susan's parents see George on the street in the city, during the time he is supposed to be in the Hamptons. Jerry is woken up early in the morning at his parent's house and gives his father the "$50" organizer that has many features besides a tip calculator. Later he discovers that Kramer has moved down there, to join the other retirees. Elaine laughs when Susan's parents ask her about George's house in the Hamptons. Of course, George just builds on the lie. Morty, who can't run for president of the condo association, decides that Kramer should run for condo board president of Del Boca Vista phase III. Once Kramer is elected, Morty will run things from behind the scenes. 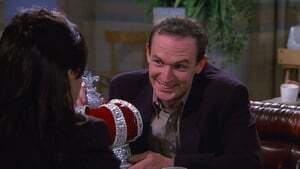 Elaine schemes to try to determine her boyfriend's race. George finds out the Rosses knew that he lied. He decides to take them to the Hamptons, to "see who'll blink first." 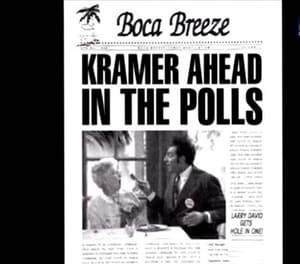 Kramer begins his campaign and the Boca Breeze has good things to say about him (see NOTE:). When Elaine's boyfriend says they are an interracial couple, she is convinced he is black. George keeps building on his lie, as he picks up the Rosses and takes them on their ride to the Hamptons. 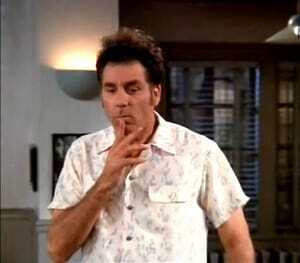 Kramer receives some bad press from the Boca Breeze; it's damage control time. Kramer suggests buying each member of the board one of those Wizard tip calculators. Jerry knows he can't get the deal he told his father he'd received, but Kramer says not to worry, Bob Saccamando's father lives down here and can help them out. Elaine and her boyfriend discover that each is not the race they thought the other was. Saccamando's father comes through with knock-off tip calculators called Willard, they are defective and the election is lost. George and the Rosses reach the Hamptons, where the truth wins out. Elaine thinks that Puddy is religious because of the presets she discovers on his car radio. The first idea George presents at a Kruger project meeting goes over great, his follow up suggestion isn't as well received. Jerry suggests that George use the old showmanship trick of leaving on a high note. 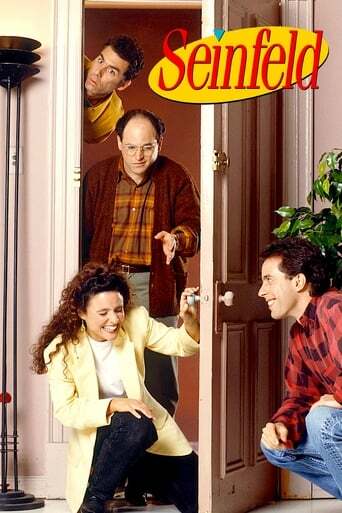 Elaine tells George and Jerry about her suspicions; George suggests that she reset his radio presets as a test. Kramer and Mickey get an acting gig playing sick for some medical students. 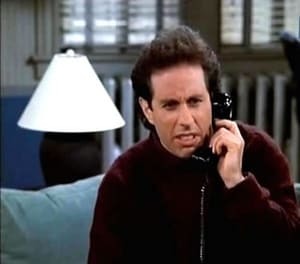 Jerry's girlfriend, Sophie, calls him with the familiar "it's me" greeting only he doesn't recognize her voice. George leaves a Kruger meeting on a high note. 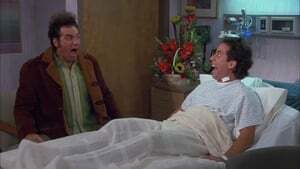 For their acting job, Mickey gets bacterial meningitis and Kramer has gonorrhea. Elaine confirms that Puddy is religious. Kramer picks up on the showmanship idea and really plays up his gonorrhea part. Sophie leaves an "it's me" message on Jerry's answering machine. George suggest he call her back with the "it's me" greeting. Sophie doesn't recognize Jerry's voice and thinks he is someone else; Jerry discovers that she hasn't told him about the tractor story. Puddy doesn't have a problem with Elaine not being religious, after all he is not the one who's "going to hell." George and Jerry speculate on what the tractor story is. Elaine begins to worry about going to hell. Kruger throws everyone off the project because they are boring, so now George is the only other member of the project team. Kramer receives rave reviews for his portrayal of gonorrhea, but now he feels he has been typecast. Jerry sees a scar on Sophie's leg and assumes it was from a tractor accident. George finds that he has to do all the actual work on the project as Kruger keeps making excuses and doesn't do any actual work. Puddy wants Elaine to steal a paper, after all she is already going to hell and he doesn't seem to care. Kramer takes Mickey's ailment. Elaine and Puddy seek the advice of a priest about where their relationship is going. Sophie tries to tell Jerry the tractor story, but he tells her not to worry about it. 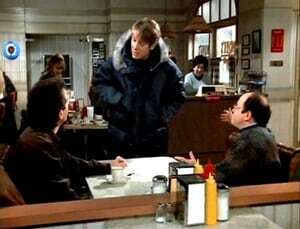 Kramer and Mickey come in arguing about getting gonorrhea and Sophie clears it up for both of them. With that, Jerry leaves on a high note. Meanwhile, back at the project meeting, Kruger decides to leave George on a high note. Elaine is confronted with cake from two separate birthday celebrations. She is tired of the forced socializing, so she calls in the sick the following day. Jerry & George are going to their old high-school hangout for one last slice of pizza. Kramer was at the police station where he obtained some caution tape used for crime scenes and also hears about a serial killer that is on the loose in the Riverside Park area. At the pizza parlor, George discovers he still has the high score on the old Frogger video game. Elaine's co-workers give her a cake to celebrate her return to work from being sick, she refuses to take part in any future celebrations. 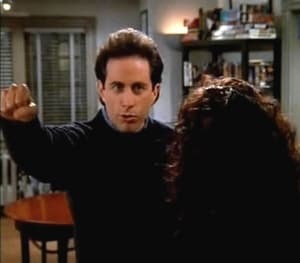 Jerry goes out with Elaine's friend Lisi, but she is a "sentence finisher, it's like dating Mad-Libs." George decides to by the Frogger machine, but Jerry asks him how he is going to move it and keep it plugged in to preserve the high score. (This pizza parlor has never had a blackout in all that time? Sometimes with sitcoms, we must suspend reality. Kramer discovers the last victim of the serial killer looked a lot like Jerry. George works to find a solution to his Frogger problem and Kramer volunteers the help of a man he knows named "Slippery Pete." Elaine misses the 4 o'clock sugar rush she had gotten used to from all the celebrations, so she decides to raid Peterman's refrigerator, where she finds a piece of cake. She finds out from Peterman that the piece of cake he has in his refrigerator is worth $29,000 because of its historical significance. The cake comes from the 1937 wedding of King Edward VIII. Jerry is looking to breakup with Lisi, but discovers that she lives in Riverside Park area. To avoid the serial killer, he takes Lisi back to his place where she finishes one of his thoughts that takes their relationship to the next level. Elaine tells Jerry and George about the cake and she also tells Jerry that Lisi is planning a weekend trip for them to Pennsylvania Dutch country. Jerry fears that Lisi received the wrong message as that kind of a trip is for a serious relationship. Elaine tries to even out Peterman's slice of cake, but gets swept up in the moment and finishes it off. George tries to coordinate the movement of Frogger machine. 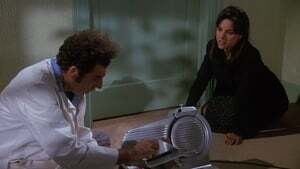 Elaine looks for a replacement for Peterman's cake, Kramer suggests an Entemann's cake. 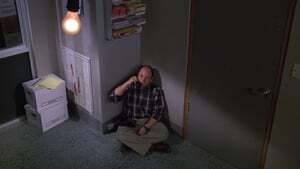 Jerry goes to Lisi's apartment, where he tries to break up with her. It goes on for ten hours, when he is ready to leave he discovers it is dark out. After exiting her apartment, he sees a man whom he fears is the serial killer and pleads to be let back in. Peterman has his piece of cake appraised at $2.19. When George finds "Slippery Pete" playing his Frogger game on battery power; it is discovered there only about three minutes of power remaining. The only available power source is across the busy street and Kramer has run out of caution tape. It's up to George to get the Frogger machine across the street; however there is no chance of a high score in this game. Later, Peterman shows Elaine surveillance videotape of her eating and "dancing" with the slice of cake; he is convinced that the age of the cake and its effect on her digestive system are all the punishment she needs.